Streaked Reed Warbler in Beijing! The STREAKED REED WARBLER is a bird that is almost certainly in serious trouble. There are very few recent records from anywhere in the world. Nobody knows where it breeds, nobody has ever recorded its song and its only known wintering grounds in the Philippines have been “developed” ( I do hate that word!) with no recent sightings. After an hour and a half we were on site and began to search the abandoned fish pond where the bird had been seen just a couple of days before. 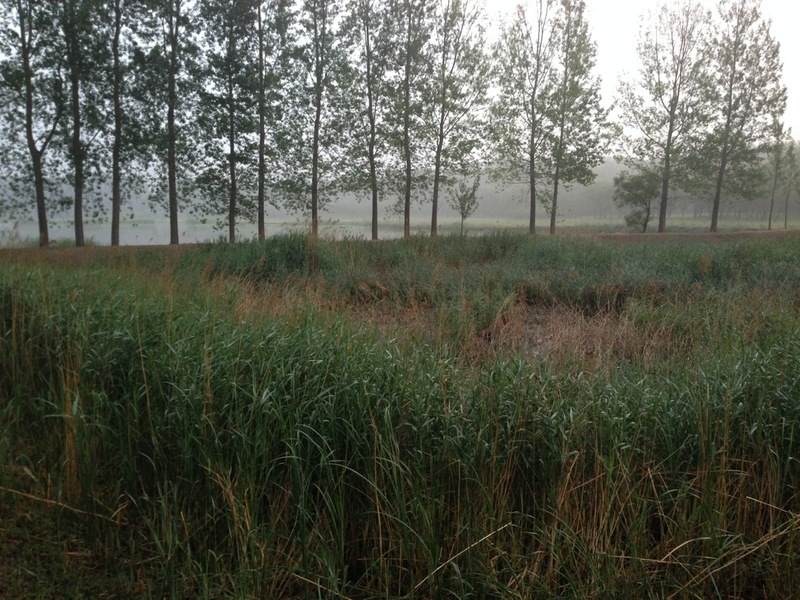 An abandoned fish pond near Yanqing, the site of the STREAKED REED WARBLER sighting on Sunday 15 June 2014. We arrived a couple of hours before dusk and planned to stay until dark and, if necessary, stay over in a local hotel and try again the following dawn. It was a beautiful, still evening and there were several ORIENTAL REED WARBLERS chuntering loudly from the reeds. We slowly made our way around the pond, carefully trying to filter out the racket from these large acros in the hope of picking out what we expected would be the quieter song of their smaller, rarer cousin. During the next two hours we heard at least 2 RUDDY-BREASTED CRAKES, INDIAN and COMMON CUCKOOS, BLACK-NAPED ORIOLE, BLACK DRONGO, MOORHEN and BROWN SHRIKE but sadly there was no sign of any smaller reed warblers. Well after dark we headed into town, checked into a local hotel and grabbed some dinner, speculating about our chances the following morning. At 0415 we were checked out and on our way to the fishpond, full of optimism. If the STREAKED REED WARBLER was still there, surely it would sing or show early morning…? On arrival, the RUDDY-BREASTED CRAKES were struggling to be heard above the chorus of the ‘churring’ and ‘chacking’ ORIENTAL REED WARBLERS and, again, we slowly walked around the raised bank that surrounded the reed-filled pond, desperately scanning and listening for anything that might be our target bird. Time and again a warbler appeared on a reed stem and, after raising our binoculars, without fail it proved to be (another!) ORIENTAL REED WARBLER. 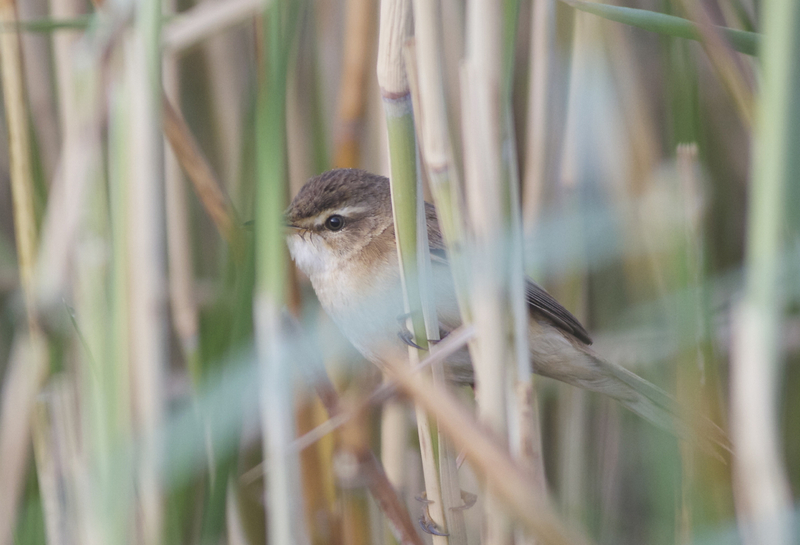 After three hours we finally admitted defeat and decided to head back to Beijing… if the STREAKED REED WARBLER was still on site it was extremely good at hiding! The most likely explanation was that it had been a late passage bird. And so this rare species continues to elude me. But I won’t have long to wait to resume the search… it’s thought to be an early return migrant with peak passage in the Beijing/Hebei coast area said to be from the last week of August to mid-September, according to LaTouche. So, yet again, I’ll be checking those reedbeds and patches of sedge in the hope that, one day, I’ll connect with this most enigmatic of birds. Of course, from a conservation perspective, it’s extremely difficult to do anything to help this bird. It’s a long distance migrant whose current breeding and wintering grounds are unknown. Recording its song would be a huge first step – at least that would help anyone travelling to northeast China and southeast Russia to locate singing birds and discover breeding sites, potentially enabling some studies to be made of the habitat requirements and hopefully identifying some of the reasons for the staggering decline in its population. But with so few being seen in the last few years, is it already too late? Big thanks to Tong Menxiu and Chen Liang for their help in finding out details of this sighting and to Zhao Chao and Paul Holt for their company on a fun search…! See here for more detail about the status of STREAKED REED WARBLER. 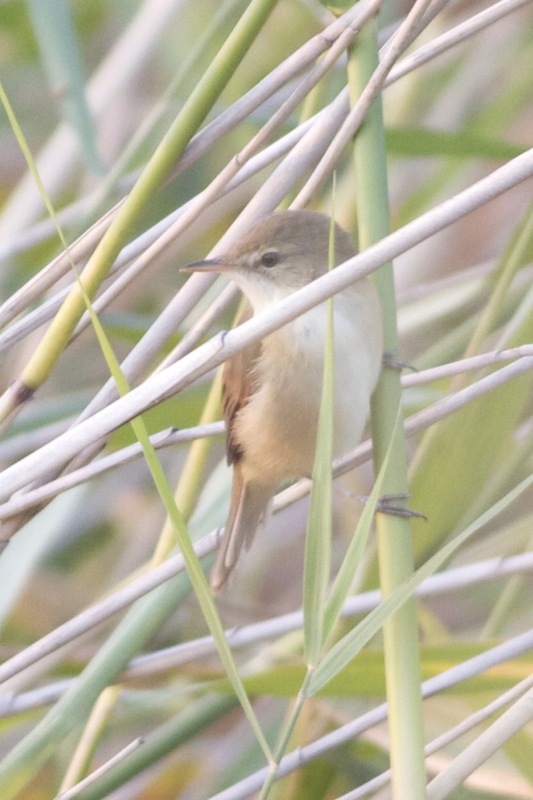 Posted on June 25, 2014 July 2, 2014 Categories UncategorizedTags Paul Holt, Streaked Reed Warbler, Yanqing, Zhao Chao3 Comments on Streaked Reed Warbler in Beijing! The last week of May and first week of June is THE best time for seeing acrocephalus warblers in Beijing. These birds arrive relatively late in the spring migration to allow the reedbeds and vegetation, on which they depend, to grow sufficiently. This Spring I have been hoping to see two specific acrocephalus warblers that I have never seen before – the Streaked Reed Warbler (Acrocephalus sorghophilus) and the Manchurian Reed Warbler (Acrocephalus tangorum). The chances of seeing the former are slim – there have been no records anywhere since 2011, when one was well-described from the Olympic Forest Park, Beijing, by a visiting birder and before that one must look back to 2009 when one was trapped in winter at Candaba Marshes, Philippines (unsure of date) and another was found by Paul Holt at the Summer Palace, Beijing, on 6 June. As far as I am aware, there have been no sightings at the well-covered migration hotspot of Beidaihe since 1999 and the breeding grounds, although thought to be in northeast China and southwest Russia, have never been discovered. This is a bird I am seriously worried about and its decline since the days of La Touche (who described it as “swarming” at Beidaihe in late August and early September in the early 20th century) has been catastrophic. Perhaps not surprisingly, I have not yet found a Streaked Reed Warbler. However, yesterday (1 June) I saw my first Manchurian Reed Warbler at Huairou Reservoir, Beijing. It is always rewarding to go birding with someone who knows a lot more than yourself – it’s one of the best ways to learn. And to go birding with a real China expert – is a treat. So when Paul Holt asked me if I wanted to accompany him for a day’s birding around the northeastern reservoirs of Huairou and Miyun, I jumped at the opportunity. 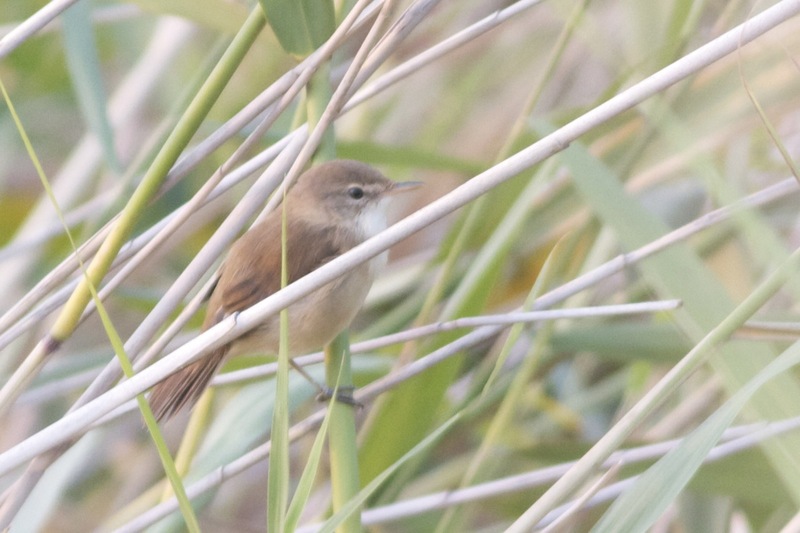 Paul had spent the previous day in the area and had found two special birds – Manchurian Reed Warbler and Chinese Bush Warbler – both, especially the latter, very difficult to see in the capital. 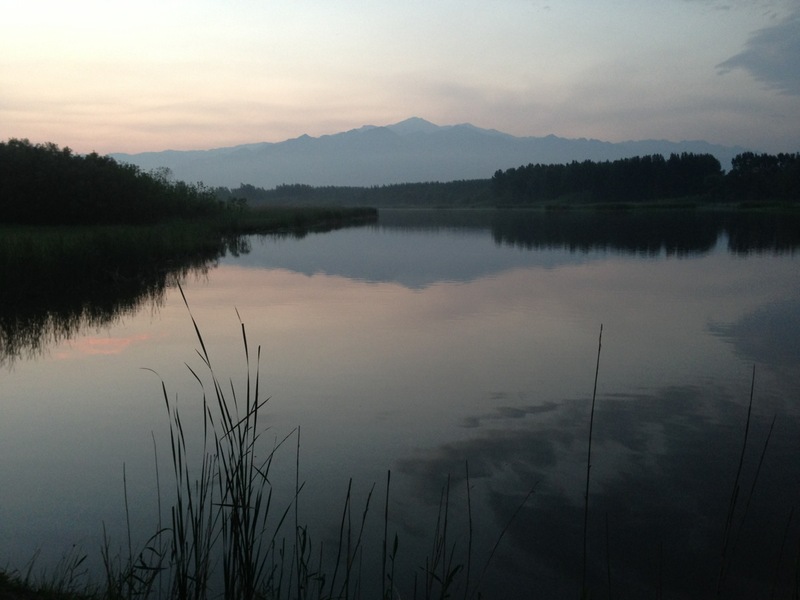 Our first stop was an area of superb habitat on the eastern fringe of Huairou Reservoir. 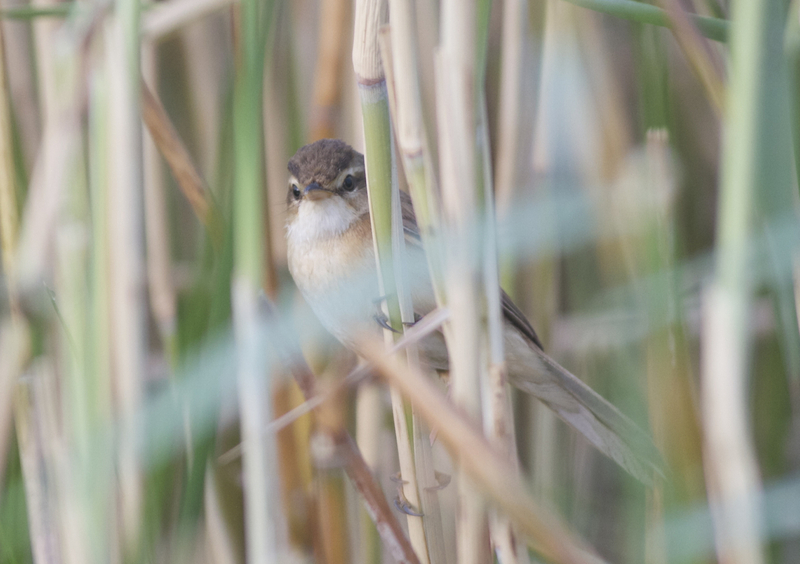 Sure enough, after a few minutes, we were listening to, and watching, a splendid Manchurian Reed Warbler…. I had wondered how straightforward separation from the similar Black-browed and Blunt-winged Warblers would be. I was a little surprised at how different they are. With a prominent, but not as broad as Black-browed, white supercilium with a limited black upper border, long bill, prominent white throat bordering buffy underparts and an almost speckled crown, this warbler, given reasonable views, is distinctive. And the song, although resembling other ‘acros‘ lacks the fast pace or repetition of Black-browed. Manchurian Reed Warbler, Huairou Reservoir, Beijing, 1 June 2013. 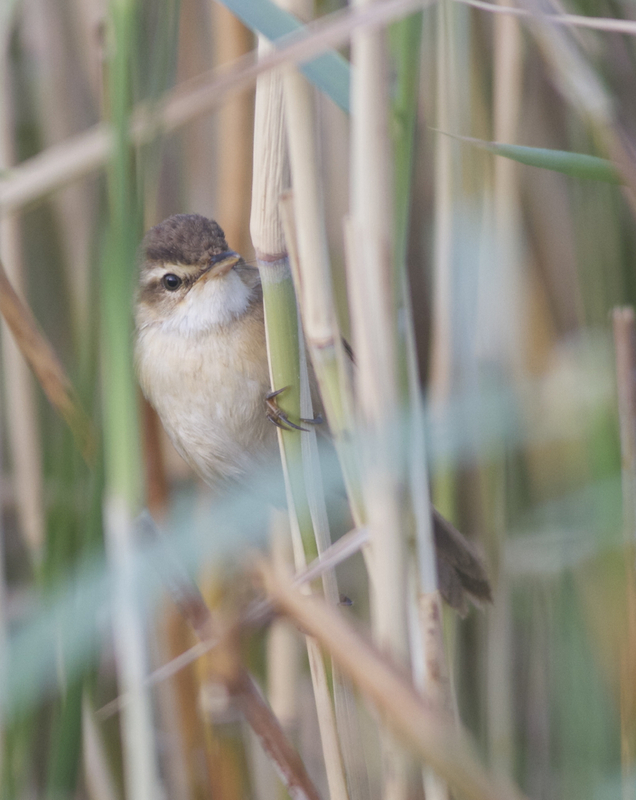 A typical view of this reed-dwelling species! Manchurian Reed Warbler, Huairou Reservoir, Beijing, 1 June 2013. Note the dark flecking in the crown – a good feature of Manchurian Reed. We enjoyed this bird for as long as 15 minutes as it made its way along a patch of reeds before moving back into a larger reedbed. Although reed warblers definitely fit into the “little brown job” of birds, the subtle differences in appearance and vocalisations make them a rewarding challenge for birders. And Manchurian Reed Warbler is a difficult bird to see anywhere. With a very restricted breeding range in northeast China (and southwest Russia), as its name suggests, the breeding grounds are relatively inaccessible and I imagine non-vocalising winter birds to be hard to find in large areas of wetland habitat. Big thanks to Paul for finding, and taking me to see, one of my most-wanted Beijing birds. Now, where’s that Streaked Reed…..? 2013: Let’s Make It A Good One! 2012 was my second full year living in China’s capital. Thanks to Libby, my understanding wife, I have been fortunate enough to make regular visits to some of the capital’s most productive birding sites and to see some stunning birds. It is a joy to spend time in the outdoors observing familiar, and some not so familiar, species whilst at the same time adding a little to the knowledge, and status, of Beijing’s avifauna. Through the growing network of Beijing-based birders, both Chinese and ex-pats, and my expanding contacts among Chinese birdwatchers, many of whom I now consider good friends, I have learned a great deal over the last 12 months. The end of the year is traditionally a time to take stock and look forward to the opportunities ahead. As in most parts of the world, it would be easy to feel depressed about the state of wild birds in China. Jankowski’s Bunting is in desperate trouble. The prospects are also grim for Baer’s Pochard. More well-known is the Chinese Crested Tern, which is in a precarious situation but hanging on, and of course Spoon-billed Sandpiper. In total there are 9 species classified as “Critically Endangered” in China. And, although only officially classified as “Vulnerable”, there is another species that I am very concerned about, a species whose song has never been recorded. Hands up if you have seen a Streaked Reed Warbler anywhere in the world in the last few years. The status of these species, almost certainly all moving in the wrong direction primarily due to habitat destruction, together with the ongoing battle against illegal poaching and bird-trapping, make it easy to paint a grim picture. However, as we welcome 2013 and despite the growing pressures faced by the natural world, I am more optimistic about the future of China’s birds. Why? Who had expected the inspirational efforts by birders, volunteers and local authorities to take down over 2km of illegal mist nets and, later, save the poisoned Oriental Storks at Beidagang? Or the brave journalist, Li Feng, who secretly recorded and exposed the illegal shooting of migratory birds in Hunan Province? These events and many others like them, publicised through social media, sparked a huge response from ordinary Chinese people, demonstrating that there is a deep and widespread concern for the welfare of wild birds in China. This, in turn, has resulted in a new government initiative to strengthen the enforcement of laws relating to illegal poaching. On 29th November, shortly after the crackdown was announced, it was reported that in October and November the local authorities in Guangdong had seized 51,622 wild animals and 9,497 bird nets, following investigations spanning 584 markets and 1,320 restaurants. According to the report, 102 people have been sentenced as a result of the crackdown. As one Chinese friend told me, the events in Hunan and at Beidagang could mark a turning point in the future of wild birds in China. So, as we enter a new year with optimism and a renewed belief that, collectively, we can make a difference, it is an appropriate time to say a big thank you to everyone who has taken the time to comment and contribute through this blog, via the associated Birding Beijing Facebook page, the Twitter feed or directly to me via email. Birding Beijing would be a shadow of itself, and less fun to write, without all of you joining in! And I am sure that I speak for all readers as I pay tribute to the hundreds of volunteers across China who have bravely taken a stand to protect their wild birds. I wish them every success in 2013 as they seek to consign to history wild bird persecution. Me with the Tianjin heroes. From left to right: Mo Xunqiang (Nemo), Wang Weihao, Wu Jianyu (Emily), me, Meng Xiangxi, Zhang Yue, Ma Yufang. I wish everyone a happy, healthy and bird-filled 2013. Posted on January 1, 2013 Categories UncategorizedTags Baer's Pochard, Chinese Crested Tern, Jankowski's Bunting, Streaked Reed Warbler12 Comments on 2013: Let’s Make It A Good One! This autumn I have a bird on my target list. It’s a bird that, in reality, I probably have almost no chance of finding because, as far as I am aware, there have been only a handful of records from anywhere in the last few years – Streaked Reed Warbler. The paucity of records may be at least partly due to the lack of observers in its breeding areas (thought to be north-east China and south-east Russia) but, from recent reports from its known wintering grounds in the Philippines, this bird is declining very rapidly. I was inspired by reading some notes from La Touche at the turn of the century who described Streaked Reed Warbler as “swarming” in late August and early September at Beidaihe. But it was more with hope than expectation that I visited Yeyahu Nature Reserve this weekend with the intention of scrutinising the reed-beds for Acro warblers. After hearing several “tack”-ing Acro warblers that revealed themselves to be the relatively common Black-browed Reed Warbler, I discovered a singing Acrocephalus warbler.. not what I expected in September! It was difficult to pick up given the noise from the earth-movers and heavy vehicles associated with the major works ongoing at Yeyahu to make it more “tourist friendly” (more on that in a later post!). Frustratingly I couldn’t see it, despite waiting in the area for around 45 minutes. Then a Chinese Grey Shrike appeared, clearly spooked the singing bird and it fell silent. After waiting around for a while just in case it started to sing again, and with no sign, I left to cover more of the reserve but with a yellow sticky note in my mind to return later. After covering the remaining reed-beds and finding more Black-browed Reed Warblers and several Oriental Reed Warblers, I returned to the same spot in the late afternoon. Incredibly, it (or a different bird) was singing again just a few metres from the original spot. This time, without the din of the earth-movers (they had packed up for the day), I was able to record it using my video camera. It didn’t sound like a Black-browed Reed Warbler but these Acro species can sound very similar, so I wasn’t sure. I tried ‘pishing‘ and immediately it popped up for the briefest of moments before dropping out of sight. My impression was of a very warmly coloured bird with a strikingly white throat and lacking the well-marked face and blackish ‘brow’ of Black-browed. I pished again. Again it clambered up a reed stem and looked at me curiously.. This time I was able to rattle off a few images with the camera before it dropped again. It continued to sing from its perch out of sight. I looked at the images on the camera and immediately knew it was not a Black-browed Reed Warbler. Any other small Acrocephalus warbler would be very interesting. The likelihood was that it was either a Manchurian Reed Warbler or a Blunt-winged Warbler, both rare in Beijing. Given the bird’s warm colouration, my instinct suggested Manchurian Reed Warbler as I had found a Blunt-winged Warbler in spring at Yeyahu which was much paler than this bird. However, the face pattern – with a supercilium in front of the eye but not behind and the lack of a black upper border – fitted better Blunt-winged. The wings also looked incredibly short, also good for Blunt-winged. An email exchange with Paul Holt confirmed it as a Blunt-winged. Apparently both Manchurian Reed and Blunt-winged look much ‘warmer’ in autumn after their moult. Result! Blunt-winged Warbler used to breed at the Summer Palace in Beijing but in recent years it has become a real rarity in Beijing. With a disjunct population, Blunt-winged Warbler is also present in parts of Central Asia and north-east India. The small population in northeast China has been the subject of speculation that it could be a different species, especially given the habitat preference seems to be different. However, my understanding is that DNA analysis has shown that they are identical. It is certainly unusual, but not unprecedented, for Acrocephalus warblers to sing in autumn. Several of the Oriental Reed Warblers on site were still chuntering away, albeit half-heartedly. So, no Streaked Reed Warbler (yet) but the Blunt-winged Warbler was a nice consolation! Here are a couple of images. Blunt-winged Warbler, Yeyahu NR, 8 September 2012. Note how the supercilium is strong in front of the eye but absent behind it. In Manchurian, the supercilium should also be present behind the eye with a narrow black upper border. Blunt-winged Warbler, Yeyahu NR, 8 September 2012.